I install chromium and pepper flash from synaptic. When I start chromium there is some videos that I can't read and I get this message : Click here to download the new adobe flash player. I'm sure I have the most rescent version install and when I was on 15.10 I had no problem to see all videos after installing pepperflash the same way. I checked in chromium plugins and flash is activate. I checked too in usr/lib/chromium-browser/plugins I have 0 item in the folder. I tried to download the libpepflashplayer.so from adobe site to copy it in the pugins floder, but it says that I don't have priviledge to do that. I could'nt go further. I spent many hours reading about it, I'm getting a little bit upset with this LTS version, that give me more bugs than 15.10. and no forum yet that could help me. I'm begging for some help, I'm not very advanced in linux, but if feel I read all I could find and I don't see anymore solutions than going back too 15.10. Enable the Canonical Partner repository. This will install both the plugin (PPAPI) for Chromium and the plugin (NPAPI) for Firefox. Not the answer you're looking for? 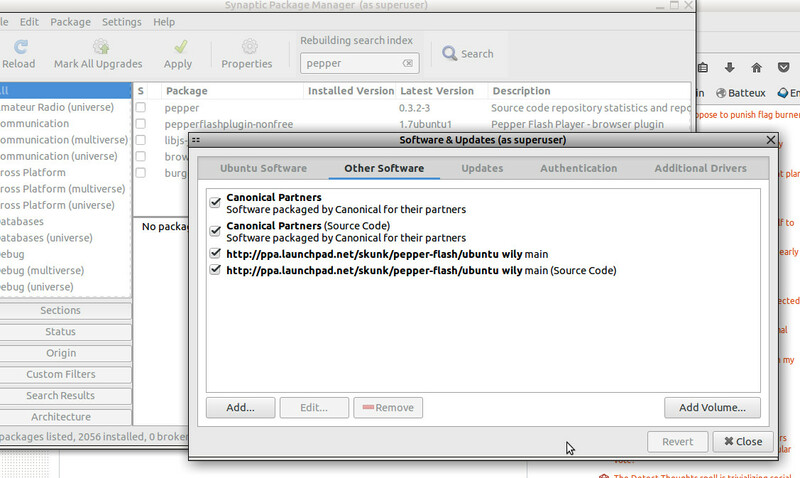 Browse other questions tagged 16.04 flash chromium plugins pepperflash or ask your own question. How do I download a flash player? Chromium + Firefox - flash doesn't function w/Pepper.